The Friday Before Labor Day – Do We Really Need to Be in the Office? You are a leader. It’s the Friday before Labor Day. You walk into the office and see only a handful of employees physically at their desks. No big deal or a problem? Last month, on the Friday before the July 4th holiday, one of my clients arrived to find only a skeletal staff on site. Her first thought was, “Where is everyone? !” even though her entire department of 200 people had just gone through the process of shifting to a high performance flexible work culture. Thankfully, she is self-aware and does her best not to let, as she calls it, her “knee-jerk Boomer mentality” get in the way of necessary change. She decided to call me to share, “This is making me very uncomfortable. What do I do?” I guided her through our “Problem, Precedent or Preference” analysis. I asked her to consider if a skeletal staff in the office is problematic in terms of providing customers with a high level of service? For her department, it was not a problem since almost everything they do can be managed remotely. Had she received any complaints that people were not responding and were difficult to reach? No. So, considering it was a slow day anyway, everyone she needed to reach was responsive and obviously working — remotely — she decided it wasn’t an issue for the business that only a few people were present in the office. Now, at other times and for other businesses the answer could be, “yes, this is a problem.” During certain business cycles, or if in-person, face-to-face interaction is required to do the job well, a leader could find that a certain number of people do need to be in the office even the Friday before a holiday weekend. If so, it’s imperative that everyone—not just the leader—sit down and coordinate on site coverage beforehand. For my client, if the work was being done, why did the lack of bodies in the office initially bother her? Is the limit on remote work before a long holiday weekend a matter of policy or precedent? Is it, “the way it’s always been done because we don’t want people to abuse it”? Maybe that was the case twenty years ago when the policy or precedent started. Back then it was harder to stay connected, remain productive and put in a full-day’s work from a remote location. 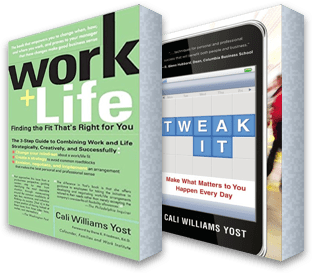 In most organizations, that’s not today’s reality, especially if employees, teams and managers have mastered the behaviors and mindset of a flexible work culture geared toward high performance. Another leader, who considers himself very open to flexible work, recently told me how disappointed he was when one of his high performers showed up in the office on that Friday before July 4th to work a half-day before leaving on vacation. She lost more than three hours of productivity commuting to and from the office when she could have actually worked if she’d stayed home. When he pointed this out she said, “I thought it was the policy.” There was no formal policy, but the “precedent” prevailed because it had never been officially disputed. So if you’re a leader who plans to go to the office Friday before a long holiday weekend that celebrates the contributions of the American workforce, and you find yourself a bit uncomfortable because you’re one of the only few there, ask yourself, “Is this a problem? Is it a precedent? Or is it a preference?” The answer may surprise you.